In our latest update to this article on the best 8-string models around, we made just one single change – replacing the Ibanez M80M Meshuggah Signature with the cost-effective ESP LTD EC-258. I’m a Beginner – Should I Buy One? If you’re on the hunt for an awesome guitar, we can certainly help you out! Welcome to our guide to buying the best 8-string guitars; giving you everything you need to know about this versatile instrument. You’re probably aware that an 8-string guitar is much less common in the mainstream guitar world than a 6-string guitar is, but the extra two strings add an extended tonal range that can really open the door to whole new world of music. This is why adventurous musicians love them. Because, while these guitars are commonly associated with heavy rock and metal, they are also favored by some jazz, classical and solo musicians who take advantage of this instrument’s awesome tonal range. However, in this article we’ll be mainly focusing on models made for metal, which help metal musicians find the deepest, darkest tones needed for a seriously heavy sound. Bands and artists such as Meshuggah, GWAR, Deftones, Korn, and the virtuoso Tosin Abasi either exclusively use 8-strings or regularly incorporate them into their music. And, after reading this article, perhaps you will too! Make sure to check out our chart below, which highlights five awesome guitars that give a good snapshot of what’s popular across several price ranges. Then be sure to check out our handy guide that follows the chart. A multi-scale Jackson 8-string providing exceptional playability. Distinctively ominous looks with this Schecter 8-string. Schecter’s more affordable Omen-8 is an excellent purchase. A wallet-friendly Les Paul-style 8-string with real attitude. An affordable 8-string RG that plays like a dream. Currently, our only non-Ibanez/Schecter on our 8-string chart comes in the shape of this awesome multi-scale Jackson SLAT8, part of their higher-end X Series. The slim one-piece maple neck is ultra-playable, with the multi-scale (26” to 28”) very much visible from the fanned frets. 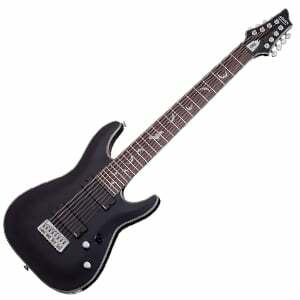 The body uses Jackson’s popular Soloist shape, and is made of a glossy black-finished basswood body with an arched top. Elsewhere, this cool 8-string – as we mention in the complete Jackson SLAT8 review – is equipped with a dark rosewood fretboard, a staggered bridge with individual saddles, and two quality EMG 909 passive humbuckers, which deliver a tight, balanced sound across the registers. Perfect axe for metal shredders, and more than stage-worthy. Looking for a mid-range 8-string guitar with some demonic attitude? Schecter’s Damien Platinum 8 should be first on your list, boasting cool shadowy looks, solid construction, and huge playability. The sound is pretty great too, thanks to the two active EMG 808 humbuckers – as we mention in the full review of the Damien Platinum 8. The guitar itself features a big 28” scale length double-cutaway body, made from solid mahogany and finished with satin black. The three-piece maple neck is awesome and super sturdy, reinforced with carbon fiber rods, and shows off intricate bat inlays across the 24-fret rosewood fretboard. Hardware keeps things playing and sounding smooth, with Grover Rotomatic tuners and a very solid fixed bridge. Another Schecter for this chart, and this time it’s a more affordable model – the Omen-8, which delivers on style, sound and value. It’s actually a simple guitar in style, with no decoration aside from the Gothic Cross inlays on the fretboard, but this minimalist look adds to its appeal. With three color choices, the Omen-8 sports a double-cutaway basswood body with a slim but sturdy reinforced maple neck, a rosewood fretboard, and 24 extra-jumbo frets. It is equipped with some good hardware, including two Schecter Diamond Plus passive humbuckers, which offer a very good output for the price (if a little muddy). Be sure to check out the full review of Schecter’s Omen 8 for all the details. A new addition to this 8-string chart is also one of the more affordable. The EC-258 from ESP LTD shows off everything the American brand is known for – style, tone and attitude. It features a 26.5” scale length with a highly-playable thin U-shaped maple neck with 22 frets, finished in the same satin black as the body. This body breaks the more traditional superstrat shape you’ll find on many other 8-strings and instead offers a cool Les Paul-esque single cutaway. As we mention in the extended review of the EC-258, the two pickups are basic ESP-designed passive humbuckers, yet do a solid job of producing a clear, aggressive sound that’s ideal for metal. The lowest-priced model on our list comes from Ibanez, but it shows off a quality that suggests it’s almost underpriced. With either a glossy black or white finish, this no-frills guitar sports a double-cutaway solid mahogany body, with a generous 27” scale length. For an 8-string with a 2.165” nut width, it’s very comfortable to play, thanks to the slim Wizard II-8 five-piece maple/walnut neck, which includes a slick rosewood fretboard, and 24 jumbo frets. As we state in the Ibanez RG8’s full review, the hardware is basic but solid, and the pickups are stock IBZ-8 passive humbuckers, but do a decent job of giving this axe a powerful voice. For the price, you really can’t go wrong! Of course, there are more than five modern 8-string models, but the five we’ve listed will give you a general idea of what’s popular and what offers good value for money in this market. Just like a 7-string guitar, the concept of an 8-string guitar is pretty easy to grasp. In most cases, when talking about modern electric guitars, there are simply two extra strings at the bass end of the fretboard – an F# and B, ahead of your usual E-A-D-G-B-E. However, some shredders prefer to remove that low F# string and add a high A as the eighth string, for more melodic versatility in the treble registers. This is the standard tuning, allowing you to play everything you could on a 6- and 7-string guitar, although some guitarists like to tune the lowest string (F#) to a low E, which gives the guitar three different E strings, making for a very full sound indeed. Physically, unlike comparing a 6-string and 7-string guitar, there’s certainly a more obvious difference in size between a 6- and 8-string guitar. Just put these two guitars side-by-side and there’s no mistaking the 8-string! While the body size and construction will pretty much be the same size, the neck and scale length is noticeably bigger. For example, take a Jackson Dinky 6-string, and a similar Dinky 8-string. The 6-string model has a nut width of roughly 1.69” while the 8-string’s nut width is around 2.16” – a big difference in the hands. As for scale length, you will typically find that such guitar has a bigger scale length, usually of a few inches to keep the tension tight – around 26.5” to 28” compared to 25.5” of a 6-string, although every manufacturer and model is different. Popular opinion is that, when it comes to eight strings, the longer the scale length the better. We agree. Things just play better and sound clearer when you drift into the 28” to 29” scale length. Are you just starting out on the guitar? A word of warning – do not buy an 8-string guitar to learn on. It’s a complicated instrument, and would serve little purpose to a complete beginner. Even if you love heavy rock and metal, consider starting with a 6-string to learn guitar fundamentals first, before complicating things with an 8-string. Trust us, you’ll be a better, less frustrated musician in the long-run. Considering how expensive some 8-string guitars can be, buying second-hand is a good route to a bargain. However, be careful – whatever your budget, when dropping cash on a used guitar, make sure it is in full working order, with functional electronics and no damage – obvious or hidden. If possible try the guitar out before you buy – don’t go on photos alone. If you are purchasing used, make sure to go with a reputable guitar store (either physical or online) that has a clear returns policy, should something go wrong. We’d also suggest you avoid buying from thrift stores and flea markets, but seriously – when was the last time you saw an 8-string guitar in a flea market?! Buying an 8-string guitar is a big step – it’s not something you do unless you either play the heaviest styles of music, are a keen jazz player, or are very much into experimentation. Perhaps a mix of all three! We’ve established that it’s harder to play and there’s a little extra theory to get to grips with than compared to guitars with less strings, but if you’re feeling ready to tackle this beast the rewards can be awesome. Whatever your budget, make sure to do some proper research before diving in for the first 8-string guitar you see. If possible, try out some of the models on your shortlist, otherwise read reviews and watch videos of your models in action – YouTube is full of them! Good luck in the hunt for your perfect instrument!